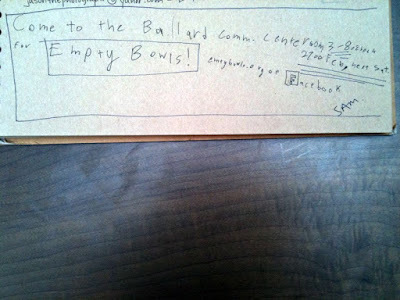 Sam, who is 11, came by the studio on Sunday to tell me about Seattle Empty Bowls and I wanted to share. To increase awareness of hunger and related issues. Through education, awareness, and action, concerned individuals can change human attitudes that allow hunger to exist. Advocate for arts education. Nurturing the creative process through the arts enhances the possibility of finding new solutions to old problems. New Bowls Released Every Hour Until 6:00!